Square Pulse has been building their TLP system generator for going on 10 years and it has become the tool for integrated circuit ESD protection development. As a non-destructive technique, it is easy to examine how the protection circuit is responding. This TLP SQP Pulsar system is the solution for anyone in the ESD design or FA arena and has benefited from continuous software and hardware enhancements; providing the pulses to ensure your protection circuits are working. With an easy to use Windows software interface (XP®, Vista® and soon to be released; Windows 7®), testing for any structure with either a packaged part, or as shown on the right, a wafer, is easily accomplished. The software has been continually enhanced and provides interfaces to many testing environments. SQP has been closely working in the TLP field for about 13 years, the last 9 plus in actually producing the product. Interest in TLP was perhaps generated when Dr. Tim Maloney (Intel) generated his “Transmission Line Pulsing Techniques For Circuit Modeling” published in 1985 in the EOS/ESD Symposium Proceedings and at IRPS. It is the first real paper on TLP use, helping to improve IC designs. It may be the most referenced paper in the History of ESD/TLP Design. The interest in TLP has grown substantially since Tim's first paper and is now part of the traditional technique to test most any protection circuit in the semiconductor arena. The Pulsar installed in a semi-automated probing environment. 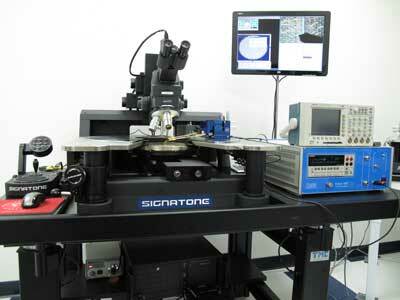 This shows a typical Signatone CM series employing both TLP and HBM in a wafer environment.